The Mets square off against the Nationals for game two of the series and season with Noah Syndergaard going up against Stephen Strasburg. The two division rivals will meet 17 more times in the regular season, 11 more times before May 23rd. “The Buffalo” Wilson Ramos lined a double over Adam Eaton’s head in right field, driving in Pete Alonso and Michael Conforto after the two hit a pair of singles. Jeff McNeil then tripled to center on a deep fly that probably should’ve be caught by Victor Robles, the hit put the Mets up by 3 in only the first inning. Syndergaard gave one back to the Nationals in the bottom half of the inning, after a Anthony Rendon double, Noah gave up a softly hit R.B.I. single to Juan Soto with two outs before getting out of the inning with the Mets up 3-1. 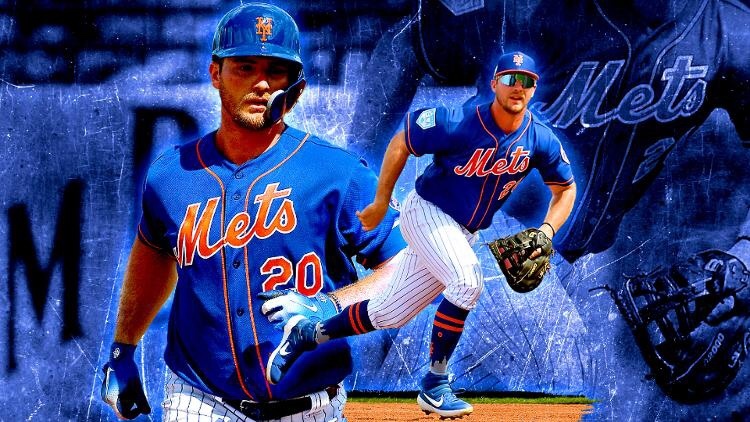 Syndergaard drew a one out walk in the third inning against Strasburg, Pete Alonso proved that to be a mistake by Strasburg as he hit a two out, line drive double over the head of Robles in center. Alonso was credited with his first M.L. extra base hit as well as R.B.I. in his very young career making it a 4-1 ballgame. Robles lead off the home third driving a long ball deep to left field for the home run off of a 95 MPH Syndergaard fastball, cutting the lead in half, 4-2. He then beaned Eaton in the elbow which lead Soto to drive in Eaton, putting the Nationals down by a run. Ramos and McNeil lead the top half of the 8th off with a pair of singles, then a walk to Rosario after falling behind 1-2 to flamethrower Trevor Rosenthal. With the bases loaded, J.D. Davis delivered his first hit as a Met, putting the Mets back up by two. Kyle Barraclough came in for relief and before he threw a single pitch, he balked to bring Rosario in from third. Alonso followed with his third hit of the day, as he smoked a double, his second of the game, off of the right field wall to drive in J.D. Davis, making it an 8-4 game. Syndergaard would end up pitching six innings, giving up seven hits, four runs (All earned), while striking out seven and walking none on the afternoon. I still definitely think that he’ll be a in the top 3 in the Cy Young award race. Familia got into a jam in the 8th with no help with J.D. Davis on the defensive side. Davis would commit an error on a routine grounder, allowing the Nationals to load the bases with two outs. As Dave Martinez decided to pinch hit for Brian Dozier with Matt Adams, Mickey Callaway countered by bringing in Seth Lugo. Adams in his career is 2-5 off of the Mets former closer. Lugo would stay and get into a bases loaded jam in the 9th and proceed to give up four runs before Callaway would call upon Diaz to finish it up with one pitch to get Suzuki to fly out to Nimmo. Diaz would pick up his second save on an 11-8 win over the Nationals. The Mets start the season off 2-0 with today’s win going to Justin Wilson, his first as a Met. Tomorrow Zack Wheeler will try to help the Mets sweep the Nationals as they put their big free agent acquisition lefty Patrick Corbin on the mound. Previous Changing the Cycles; Jacob deGrom & Robinson Cano are the Mets strategic Brain Trust. Next New York Mets or the Flushing Zoo?